We found some great interesting SUPPORT knowledge and we wanted to share with our loyal readers/customers and You Too! DID YOU KNOW???? There are actually studies that have been done in Japan on ambient sensing. 1. Lemon. This scent promotes concentration and has calming and clarifying properties that are helpful when you’re feeling angry, anxious or run down. 3. Jasmine. Like lavender, jasmine is also used to calm nerves, but this oil is also commonly used as an antidepressant because of its uplifting capabilities that produce a feeling of confidence, optimism and revitalized energy. 4. Rosemary. In addition to improving memory retention, rosemary has stimulating properties that fight physical exhaustion, headaches and mental fatigue. 6. Peppermint. Try peppermint when brainstorming. An energy booster, this scent invigorates the mind, promotes concentration and stimulates clear thinking. We all SHARE the AIR, lets make our AIR work for US! by using Odor Angel we can at least compliment Mother Nature in this aspect . "Watching Over Your Dollars and Scents"
6 Plants to Keep Bugs Away! BEES ,and other flying biting insects. It is ideal for planting around outdoor seating areas, pathways and close to doorways and windows; for maximum benefit, plant in conjunction with citronella grass and lavender (see below). In addition to its insect repellent qualities, feverfew also has many medicinal uses. It is historically used to help treat nervous disorders, headaches and it also works as a laxative and helps ease bloating. Pyrethrum helps to repel a whole host of insects and bugs, including: aphids, leafhoppers, spider mites, harlequin bugs and ticks. Pennyroyal helps to repel mosquitoes, gnats and also ticks and fleas! Pennyroyal is often used in commercial natural insect repellent creams and sprays. Pennyroyal is great to plant in the garden, but it is best utilized as a topical insect repellent applied to the skin. If you crush pennyroyal leaves and rub them onto your skin, this acts as an effective insect repellent. Additionally, you can also crush the stems and put them in pockets, bags and hats. Crushed pennyroyal leaves and stems can also be rubbed on dogs to help repel ticks and fleas. Actually you will often see dogs rubbing in pennyroyal patches when outdoors. 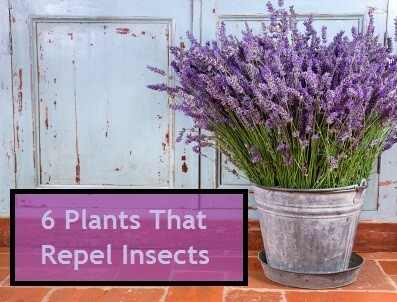 Lavender is most useful for repelling mosquitoes and gnats when planted in the garden; it can also be planted in pots and placed by doorways and windows. As with feverfew and citronella grass; lavender is best planted in the garden around seated and eating areas and also around windows and doors. Cut and or dried lavender can also be placed on windowsills to stop mosquitoes entering the house. Additionally, dried lavender flowers can also be used in wardrobes to repel moths and keep clothes smelling fresh. Lavender also smells amazing and has many medicinal properties, it aids relaxation and helps promote restful sleep. As with pyrethrum, marigolds are best used as a ‘companion plant’ to help protect other plants; however, marigolds do also have some mosquito repellent properties, so it’s a bit of an all-rounder. Citronella grass is an old favourite; everyone knows it is commonly used as an insect repellent in outdoor candles, which are used around outdoor eating and seating areas. Citronella grass is a great mosquito repellent and it can be planted and used in a similar way as citronella candles, to keep flying insects away. For best results, plant citronella grass in the garden and use in conjunction with feverfew and lavender. Additionally, citronella grass has also been found to have a calming effect on barking dogs, which is worth considering if you have a dog which barks excessively day and night. Your neighbors might thank you for at least giving it a try!